Fact: About 3,400 Americans die each year in fires and about 17,500 are injured. Offered as stand-alone units or combination units, smoke and carbon monoxide detectors are critical equipment for any home or business. Ohio guidelines for residential smoke detectors is that for new construction of homes every level of the house needs a smoke detector and all occupied sleep areas need one as well. Ohio guidelines for commercial smoke detectors is that for most systems in a commercial setting with a design capacity greater than 2,000 cfm return air, they are required to be installed. For commercial purposes, duct mounted smoke detectors are common. Fact: replace smoke alarms and carbon monoxide detectors every 7-10 years. Fact: In just two minutes, a fire can become life-threatening. In five minutes, a residence can be engulfed in flames. Fact: Each year, more than 400 Americans die from unintentional CO poisoning not linked to fires, more than 20,000 visit the emergency room, and more than 4,000 are hospitalized. Combination alarms save space, money, and time. You’ll only have to change the batteries once a year for one device and replace that device every 7-10 years, depending on manufacture guidelines. Some models of smart detectors have voice warnings that tell the owner where and what the problem is. Smart smoke and carbon monoxide detectors are available as well. They can even alert your smart device of a problem, protecting even while you are away. There are other features that matter and help, some models test themselves, have night lights built in, can tell the difference between steam and smoke, and can be quieted by a smart device. Leaks and frozen pipes can cause serious damage to your home or business. Water and freeze sensors can be used to get an early alert of an issue before it turns into a disaster. Placed around water sources inside the house, they will alert you to a problem as it occurs. Smart water and freeze sensors can be connected to your smart device that monitor and inform you of problems even if you are not there. Multiple sensors can be installed to the network to pinpoint problems as well. Make sure your furnace, air handler, air conditioner, heat pump, boiler, and ductless mini split system are protected from damage due to surges. There are two main ways surges occur in your system, lightning and switching surges. Lightning surges are random events, but switching surges can occur every day from normal use of common appliance to normal operations of the power company. Both types of surges are able to be protected against. We recommend all appliances and electronics in your home or business be protected from surges. Your heating and cooling system can be protected by an additional add on surge protector. Some models offer connected equipment warranties as well to cover losses from surges. A thermostat’s basic function is to regulate the heating and cooling system by sensing the temperature and performing a heating or cooling action to maintain that set temperature. Wi-Fi connected thermostats offer additional features to monitor and protect your home or business. When properly set up, some smart wi-fi thermostats can monitor and inform the owner of issues such as indoor freezing temperatures, filter replacement needed, service reminders, and even equipment failure. 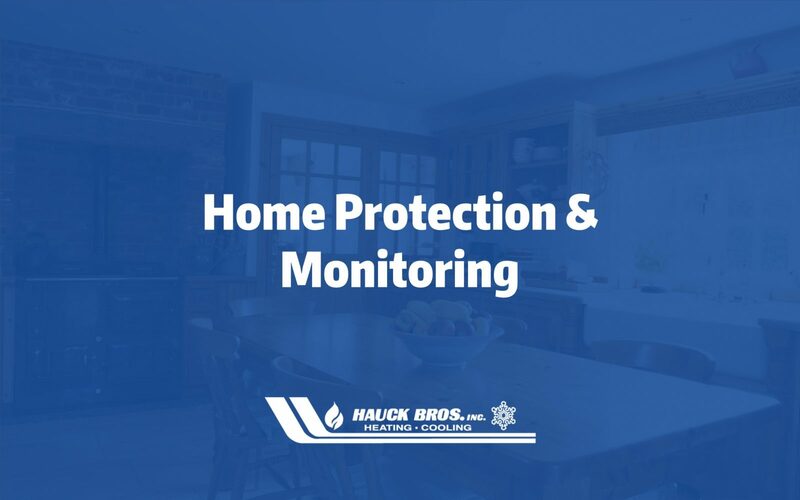 Hauck Bros., Inc. offers other accessories that can be used in conjunction with your heating and cooling system to protect and monitor your home or business. Line set covers, air conditioner covers, air filtration systems, home automation products, wind baffles, hard start kits, and condensate pumps are a few of the accessories that can be added to protect your equipment. Need some more recommendations from our professionals? Schedule a consultation today! 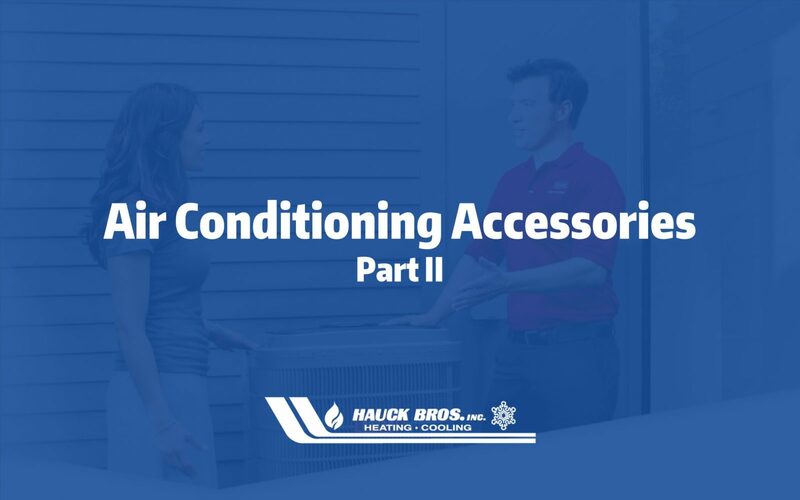 Last week, we talked about a few accessories to help keep your air conditioning unit running optimally during the summer months. Here are a few more! How it works – Air conditioners are covered during the fall, winter, and spring to protect from the elements and the environment/ Harsh weather, ultraviolet rays, flying debris, ice, and snow. How it works – In HVAC or refrigeration process, the water that condensate need to be channeled out from the building to proper drainage outside the building. The condensation process usually occurred when the air passes though the cold evaporator coil during the cooling process. As a result, the moisture that accumulate on the coil then drip down into the drain pan that is placed underneath the coils. Systems that are able to use the gravitational force to flow the water that accumulate on the drain pan does not require the use of the pump. However, there are many instances when the air conditioning systems require to use of this pump to get the water out to prevent the water from dripping into the space. How it works – Is an electrical component that is attached to the condensing unit of the air conditioner. This device allows the compressor to start up quickly and use less power during the process. It ultimately lets you save money on your energy bill. A hard start kit is a combination of a relay and a start capacitor. When the air conditioner starts up, the relay is on. This means that the energy being stored in the capacitor is being used to power the compressor. The relay then reads the electrical current from the compressor and upon arriving at a certain level or when the compressor is fully running, the relay is turned off or rendered out of the circuit. This action renders the start capacitor no longer needed to aid the compressor. Have questions about keeping your unit running smoothly? Give us a call to schedule a consultation!